Disclaimer: "All rights reserved to Heathers The Musical & Team Salvato. This is solely a not-for-profit fan activity". 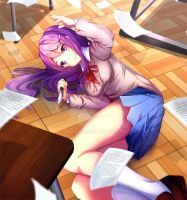 Yuri: (as Heather C.) Well f** me gently with a knife, Do I look like Mother Theresa? Natsuki: (as Heather D.)I prayed for the death of Yuri many times and I felt bad everytime I did it but I kept doing it anyway. Sayori: (as Heather M.)Suicide is a private thing. MC: (as Veronica. )You're throwing your life away to become a statistic on U.S..That's about the least private thing I can think of. Yuri, Yuri, Yuri, and (INSERT RANDOM NAME). YASS nice reference! i love how you did the shading in their hair! its too perfect, but instead of veronica having an evil boyfriend, shes the murderer. I think I woulds JUST monika was left out of this drawing. I just found out about that musical last night, then I find this. Simple, Great, I like it. They're all so cute! I love the outfits. I wouldn't mind tasting their sweets, or other goods. This is the crossover I didn't know I needed until now. C'mon, Monika would obvs be Heather. YES!!! DDLC x Heather ! I didn't know I needed this, but I do! Strange mixture but really good! very good drawing! good coloring! Huh, interesting concept. Nice art! A CROSSOVER OF MY FAVORITE GAME AND FAVORITE MUSICAL? ThiS iS pERFECTIOn's ARt CroSsOvEr form OH mY. This is amazing. Does this mean Monica is J.D? so cute , very cool work! This is great on many, many levels.